The following video is brought to you courtesy of the NutritionFacts.org YouTube Channel. Click the video below to watch it now. Here’s the third installation of our new recipe videos, brought to you by Wendy and Eric Day (livelydays.com). If you missed the first two, check out Morning Grain Bowls (https://nutritionfacts.org/video/recipe-morning-grain-bowls) and Edamame Guacamole (https://nutritionfacts.org/video/recipe-edamame-guacamole). Get the full written recipe here: Super Salad with Garlic Caesar Dressing & Hemp Hearts (https://nutritionfacts.org/recipe/super-salad). Have a question about this video? 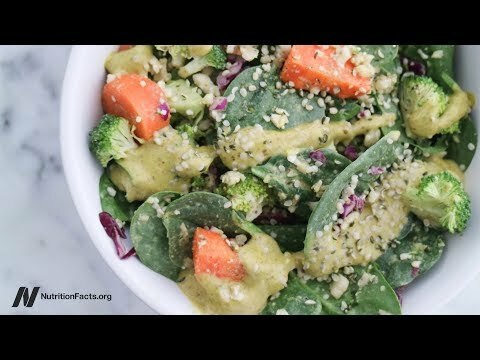 Leave it in the comment section at http://nutritionfacts.org/video/recipe-garlic-caesar-salad-dressing and someone on the NutritionFacts.org team will try to answer it.